« Are Earnings Really Driving The Market Higher? This week the ChartCraft measure of stock newsletter editors sentiment was little changed from last week: 49.5% bullish and 23.1% bearish. That’s another week where twice as many are optimistic that the stock market will continue to rise. A remarkable long string of weeks but so far they have been correct. The US retail investors meanwhile, as measured by the weekly AAII sentiment poll are slightly less confident. There was a 6% point fall to 41% bullish. And the opposing camp increased a smidgen to 36% bearish. All in all, this metric is slightly elevated towards too much optimism but still not enough to warrant our full attention. 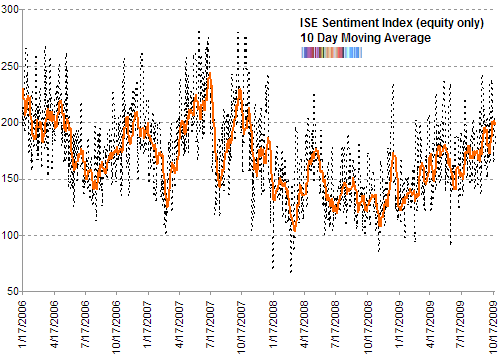 The Hulbert Stock Newsletter Sentiment Index (HSNSI) which measures a subset of newsletters which try to time the market continues to be muted. For the most part the HSNSI is showing skepticism in the face of the continuing rally. The HSNSI is about as bullish as it was back in April 2009 when the S&P 500 was trading at 800 - some 280 points lower. That is to say the average market exposure recommended by market timing newsletter is only 32.3% (long) - slightly lower (by 2.3% points) than what they were recommending 6 months ago. Such an unflappably consistent skepticism in the face of a gravity defying rally hardly gives the bears much ammunition. During economic contractions, the average Michigan consumer sentiment is 74. The average during economic expansions is 91. 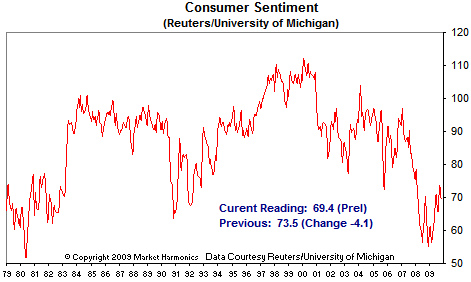 And on average when the S&P 500 has rallied 60% from a recessionary low, this consumer sentiment reading is 90.5. These historical patterns offer a remarkable contrast to where we are today - especially if we consider the often repeated mantra that we are in full blown recovery mode. 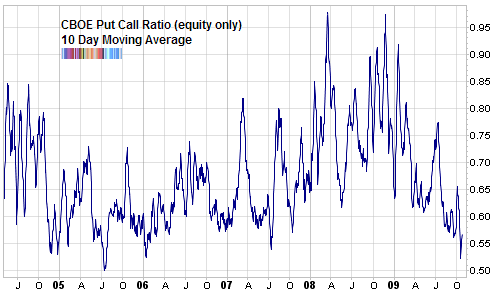 The 10 day simple average of the ISE sentiment index (equity only) call put ratio has an enviable track record - in the intermediate time frame. Almost every time it has reached 200, the stock market has meandered then stumbled. Not at all surprising since this implies that for the past 10 trading days, relative to puts, more than twice the number of calls have been purchased to open an options trade. Not once has the stock market been able to muster a significant rally when we’ve seen this metric reach such an extreme reading. The first was at the start of 2006 - the S&P 500 plateaued then fell into the summer. It wasn’t until September 2006 that it had reached a new high for the year. The next instance was late in 2006. This was not the best signal since the market did manage to continue to climb momentarily. By March 2007 the S&P 500 was back at the same level. Then it was May and October 2007 when the ISE’s 10 day average again touched 200. During that time frame the market did manage to push against the tide but over all it went nowhere. And we all know what happened after that. Last month we looked at the remarkable trend in fund flows for US retail mutual fund investors where even after a 60% rally in the S&P 500, the love affair with bonds continues at the expense of equity mutual funds. Since then the same trend has more or less continued. Bond funds are still getting the majority of investors money but this week the ICI estimates they only got $8.80 billion (while last week it was almost double that at inflows of $15.21 billion). Equity outflows meanwhile have ameliorated with an estimated $3.39 billion being withdrawn for the week. This is down by about $1 billion from last week. While a portion of this trend can be explained by the massive number of retail investors who are approaching retirement age, I can’t believe that that is the whole story. This bear market left a traumatic and indelible mark on those who lived through it, either as traders, investors, professionals or mere mortals. If this is true, then going forward, this means that we have to be very careful in how we calibrate our most trusted sentiment gauges. Regarding retail investors, I already said here and keep thinking it’s true: the last 2 bubbles fooled many, it’s very unlikely it will happen 3rd time. The more they push (you all know who), more we hoard. Dacian - that’s exactly why this market is going to keep going up. The retail investor is always wrong. burt, that we don’t know. You might be right. But by now, unfortunately for those you call “smart money”, eventually the stupid who’s wrong all the time will realize how fraudulent the game is. That’s why I said that it might not work this time. And just for the sake of argument, you need to show me a graph with smart money. Because I’ll show you one which shows that smart moeny (calculated as “public to specialist short ratio” “specialist short to total short ratio” “SP100 option traders”) is neutral since July, while they were very bullish in March. If your read this blog regularly, you will see that retail investors are actually rather bullish (CPOE call ration touched 200 as shown in the article). Why also might count this time is that those stupid retail people might not have money this time to “gamble” in stocks. One of the things I like about this blog is that it puts some thought into the sentiment indicators, rather than just making pronouncements from obvious data. (”Retail is bearish! Buy!”) Whoever it is who writes this, thanks a lot. I believe that the reason retail lost so much in the past decade is not manipulation, but simple ignorance of value. Bluntly, you didn’t have to be an insider to know that tech stocks in 2000 or CDOs in 2006 were overvalued. You just had to have reasonable business common sense, and the willingness to do your own work rather than listening to the media. Likewise you didn’t have to have any particular in to realize that SP500 at 666 had real value. Those are the kind of decisions that make the real money in the market. However most of the time the decisions are not that clear. For now, my models are indicating a 5% return for the next 10 years. Worth the risk? Probably. But really, this is the time for smaller positions and tactical trading. That’s where a blog like this comes in. Also, forget the specialists. They are in the process of being destroyed by the computers. Good riddance. burt, back in March the market was cheap; it’s not the case anymore. The market is not very expensive if we would be in a normally functioning economy; but we’re not, the economy is quite weak by a lot of measures. So given the environment, the market is not cheap here. It could go much higher, that I don’t know. But because you speak about value, while there are some companies out there (small caps) which are ignored by computers (because they are quite illiquid) I can’t really find any value. Now regarding retailers; these people are herding (trend followers). So they can’t be wrong all the time; as far as the trend persists and they go with the trend, they are correct. Retail people are wrong at market turns. But professionals are wrong as well sometime. So the statement: the market will go higher just because the retailers are not in yet is not solid enough. Again, I have no clue where the market goes from here; imo, the risk is quite high (the market is not cheap and there are still many problems with too many people betting the FED will sort out things like magic). I’m for one neutral here (hedged) and not buying.